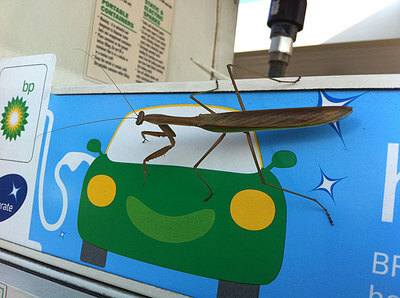 If a praying mantis were attacking BP headquarters, who would you root for? This kid, before age 4 is way cooler than I’ll ever be! I love watching the pure joy he gets out of playing the drums. I’ve lived in Cincinnati most of my life and I finally made it to The Cone in West Chester. I’ve driven by the distinctive ice cream cone shaped building many times, but when I’m actually in the mood for ice cream, The Cone always seemed too out of the way. But, tonight after dinner in the Union Centre area we decided to make a trip over. 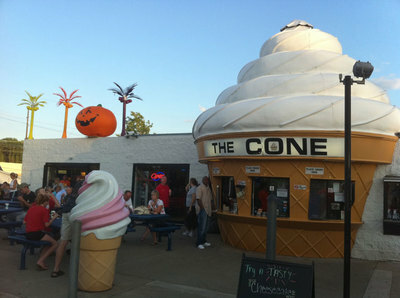 It was a busy night at The Cone with a large gathering of people enjoying ice cream at the outdoor tables. 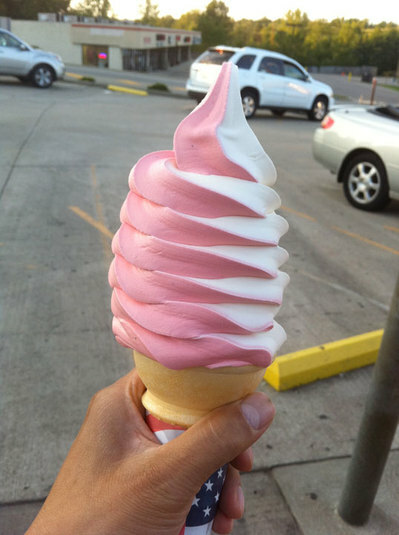 After looking at the extensive menu of sundaes and dipped cones, I opted for something simple, a large cone with a vanilla/strawberry swirl. This is the best tasting soft serve ice cream that I’ve had in Cincinnati. The strawberry was much more natural tasting than what you would expect for soft serve. It even had little specks of strawberry in it! My expectations for soft serve are pretty low because in my experience, it’s served out of convenience rather than taste. But, even though the ice cream was great, the large cone is still a little more ice cream than what I needed. I got taken in by the .50 cent up sell from the small. The dipped cones came in all sorts of interesting colors. We saw a girl eating a dipped cone with electric blue “magic” shell. It’s a favorite of the kids, but a nightmare for clothing and car seats. If you’re in West Chester, definitely stop by the The Cone. I know that I’ll by stopping by again in the future. A pictorial history of some of the MIT pranks. Good stuff. I was reading about the proposal to turn the Old St. George Church in Clifton Heights into a boutique hotel. 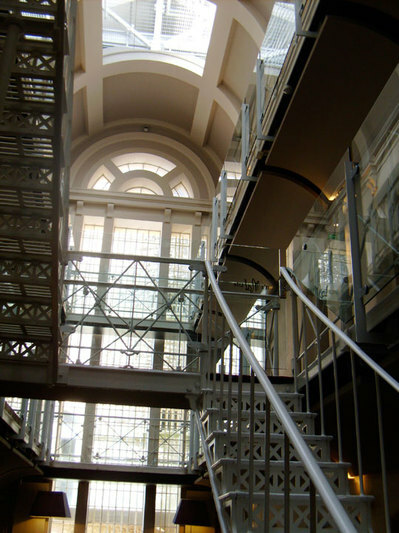 It reminded me of a hotel, the Malmaison that I visited last year in Oxford, England. 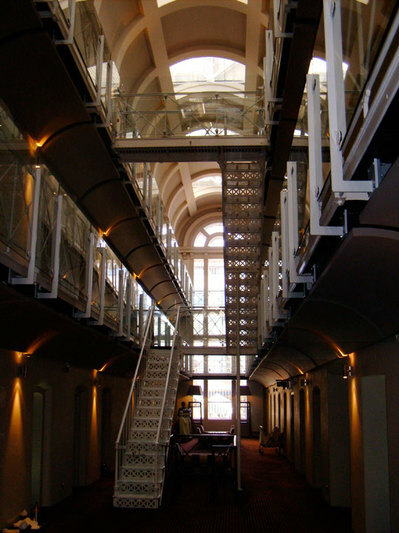 It’s a hotel that was that was created not from a church but an old prison. Instead of completely gutting it to the shell, they left in quite a few aspects of the prison. 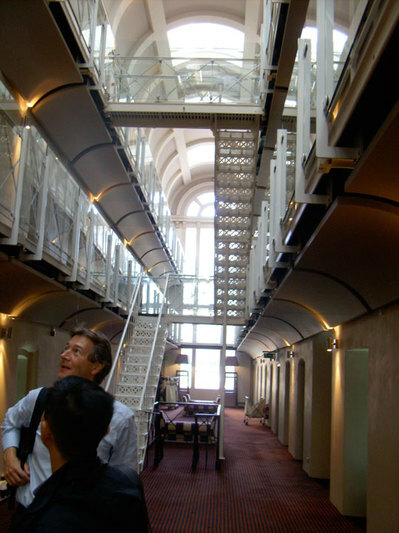 The jail cells are the rooms, but larger, combining multiple jail cells to create rooms fit for paying customers. The old stairs and walkways really give the hotel the prison feel, which is a fun contrast from the lush carpet and furniture. It would be nice if the plans for St. George kept some of the elements of what makes it unique. Also, according to medical records, there are at least nine miners who would be too overweight to fit through the proposed shaft to rescue them, Manalich said. The miners are believed to have lost about 8 kg (17 pounds) so far during their time in the mine, and officials expect that the overweight miners will be able to be rescued by the time the shaft is completed. “Believe me, they will lose weight,” Manalich said. So far this story is turning out better than the other cave-ins, but this ordeal is just beginning. I can’t imagine what it would be like to be trapped with 32 others for three months in a space the size of a studio apartment. Interesting article on the state of women’s tennis. The highlight of this article is the slow motion video feature that focuses on the beauty of the female form. El Mac and Retna are extremely talented street artists painting enormous works using spray paint. It’s hard to believe that El Mac can create such detailed portraits using a tool as imprecise as a spray can. Of Our Youth – RETNA • EL MAC from RVCA on Vimeo. Author J.D. 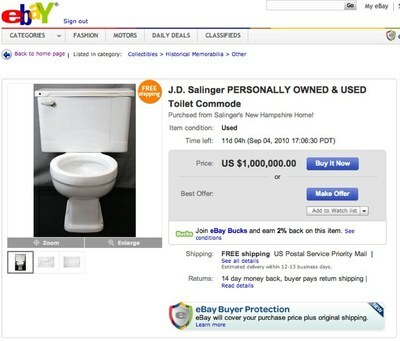 Salinger’s toilet is on eBay. Asking price? One million dollars. And an added bonus. It’s not been cleaned! This vintage toilet is from 1962 and is dated under the lid. It will come to you uncleaned and in it’s original condition when it was removed from Salinger’s old home! 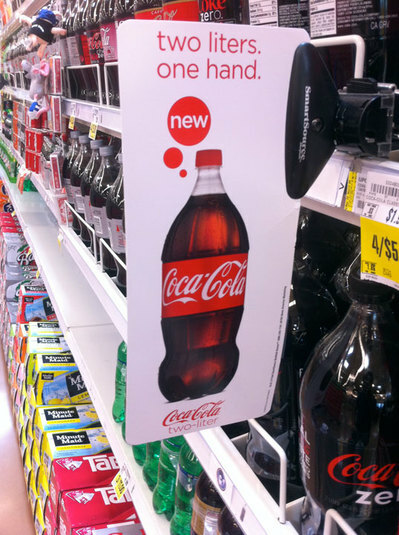 My first thought when I saw this sign is that Coke has now made it easier to hold and drink Coke straight from a two liter bottle.